Helen Iona Dugan Mercer was born September 13, 1914 to Earl & Anna (Snethen) Dugan in Mount Ayr, Iowa. 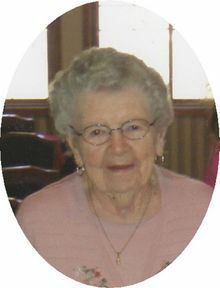 Helen departed this life on February 7, 2007 at Clearview Home in Mount Ayr. Helen graduated from Mount Ayr High School in 1932 and was a rural school teacher in Liberty Township. On May 9, 1936 she was united in marriage to Edwin C. Mercer in Des Moines, Iowa. To this union was born 2 daughters, Janice Elaine and Mary Jane. When her girls were growing up, she was a Sunday school teacher, campfire girl's leader and an officer in Band Mothers. Helen was a long time member of the First Christian Church in Mount Ayr, joining in 1934 of Modern Mothers Club as well as the Women's Society at the Christian Church. Gray Ladies, Ringgold County Hospital Auxiliary, and the American Legion Auxiliary.. She volunteered at the Blood bank for many years and was a volunteer at Clearview Nursing Home until she moved to Clearview Estates in October of 2004. She made many quilts and afghans for her daughters, grandchildren, great grandchildren and others. She lived her entire life in Ringgold County. For 15 years, she and her husband Edwin spent the winters months in Texas. Helen was preceded in death by her parents; husband Edwin in 1992; and infant brother LeRoy Harber; and an infant grandson Jay Allen Fink. Helen is survived by her 2 daughters Janice Fink of Glendale, AZ and Mary Jane Sickels & husband Alvin of Branson, MO; grandchildren Robin Tourville & husband Darren of Ozark, MO, Amy Chengalaran & husband Vereen of Gilbert AZ, Mark Sickels of Indianola, Leslie Soyer & husband Adam of Norwalk, IA, Emily Scharbrough & husband Fred of Branson, MO; 9 great grandchildren Justin Peppmeier, Makenna & Madison Tourville, Jacob, Jared, & Jessica Sickels, Alex Soyer, Kyle & Kaden Scharbrough.